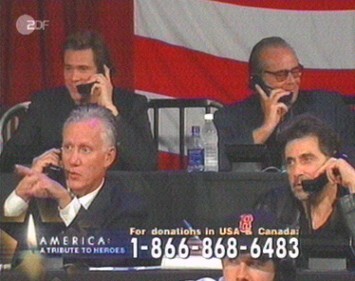 America: A Tribute to Heroes was a benefit concert organized by actor George Clooney and broadcast by the four major US television networks in the aftermath of the 9/11 attacks on the World Trade Center and The Pentagon. 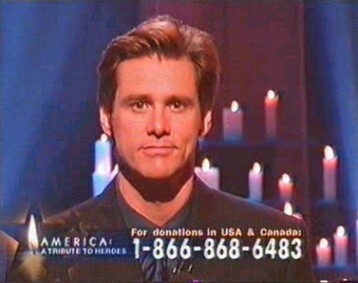 Done in the style of a telethon, it featured a number of national and international entertainers performing to raise money for the victims and their families, particularly but not limited to the New York City firefighters and police officers. It aired September 21, 2001, uninterrupted and commercial-free. Bruce Springsteen, Stevie Wonder, U2, Faith Hill, Neil Young, Mariah Carey, Sheryl Crow, Jon Bon Jovi, Pearl Jam, Enrique Iglesias, Billy Joel and Céline Dion. Jim Carrey, Tom Hanks, George Clooney, Will Smith, Muhammad Ali, Cameron Diaz, Robin Williams, Tom Cruise, Chris Rock, Robert De Niro and Clint Eastwood. The show was simulcast by over 35 network and cable channels in America and distributed to 210 countries. It proved to be taste- and respectful of the victims of the tragedy and helped raising donations for long-term relief efforts of more than $150 million. Jim Carrey donated $1,000,000 to the families of the victims of the terror attack. Jim Carrey's publicist gave this statement: "with his deepest sympathy for their unredeemable personal losses. He hopes this donation encourages other people to contribute as generously as they can." Jim Carrey told the touching story of two survivors who carried a woman in a wheelchair 68 stories down the stairs to escape from the twin towers because she had been unable to save herself, without even knowing her name. He also answered the phone to take donations from viewers from USA and Canada.